Despite only making his first appearance a handful of issues ago, Hobgoblin’s rapid ascension to power in both the fictitious world of Spider-Man comic books, and the real world of public perception is on front and center display in Amazing Spider-Man #244. 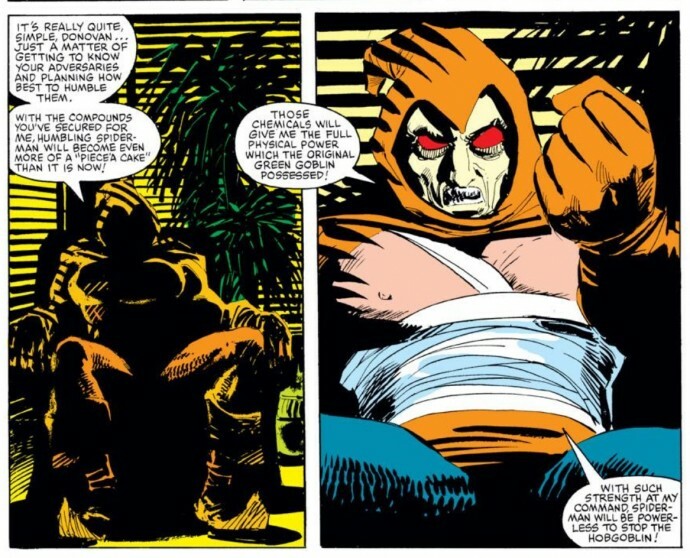 Showing how much confidence he has in his new villain, writer Roger Stern crafts an entire issue around the ominous threat of the Hobgoblin, and yet the reader doesn’t even physically see the Hobgoblin until the very last page of the story. But I wouldn’t, by any stretch, consider Hobgoblin’s brief appearance to be a “cameo.” ASM #244 is undoubtedly a Spider-Man vs. Hobgoblin story, it’s just that Spider-Man himself doesn’t know in what form or variety the Hobgoblin is making his move. Only adding to the epic-nature of the “Original Hobgoblin Saga,” is that Stern and artist John Romita Jr., are showcasing Peter Parker going through some major changes and transitions in his life. Due to the severity of the injuries Peter’s new love interest, Black Cat, sustained in Spectacular Spider-Man’s “Owl/Octopus War” arc, he’s decided to take a “leave of absence” from graduate school at Empire State University. 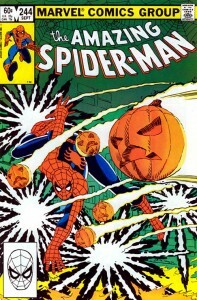 Similar to how this arc’s first chapter, ASM #238, opened up – briefly re-telling Peter’s origin story in relation to how his Aunt May has evolved from the death of Uncle Ben in recent years – Spider-Man stories always get some added emotional weight when the spotlight is on major developments for Peter and co. outside of the Spidey suit. In terms of Peter’s graduate degree, we learn in his very first appearance that Peter is a guy who values science and education – so much so that he’s dubbed a “bookworm” and “wallflower” by school bullies like Flash Thompson. Previous Spider-Man comic creative teams have gone to great lengths to highlight Peter’s high school and undergraduate graduations and Peter himself has always been adamant about trying to balance his education with his superhero life. But his leave of absence in ASM #244 demonstrates that Peter is ultimately sticking with Spider-Man for the long haul, and that his responsibility to his great physical power trumps his responsibility to nurture his great mind. Beyond the huge ramifications of Peter’s life decision, Stern and Romita Jr. get to make some funny commentary about the higher education system when Peter webs his jerk of a dean in his office after the guy made him await around for hours to sign some paperwork (I really love JRJR’s work on the dean in this issue. Total scumbucket). 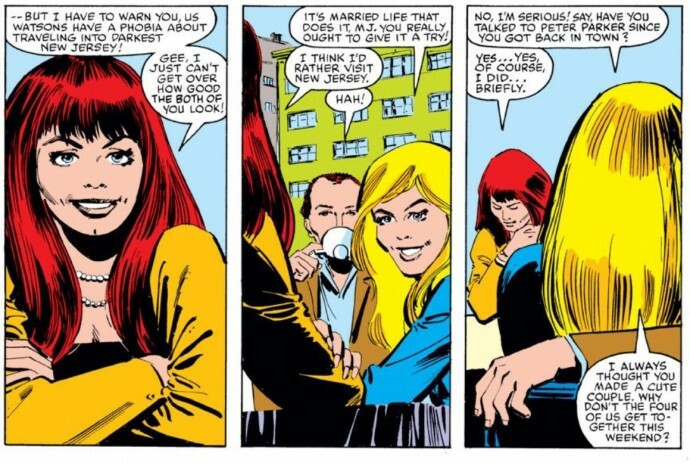 Upping the ante even more is the return of Mary Jane Watson, who has lunch with Harry and Liz Osborn and gets a friendly lecture about the need to settle down. While it looks like Peter is readying himself to settle down with the Black Cat, I think it’s fairly well-telegraphed that a Felicia/Peter romance has “bad idea jeans” written all over it. So MJ’s appearance in this arc is definitely a head-turner. 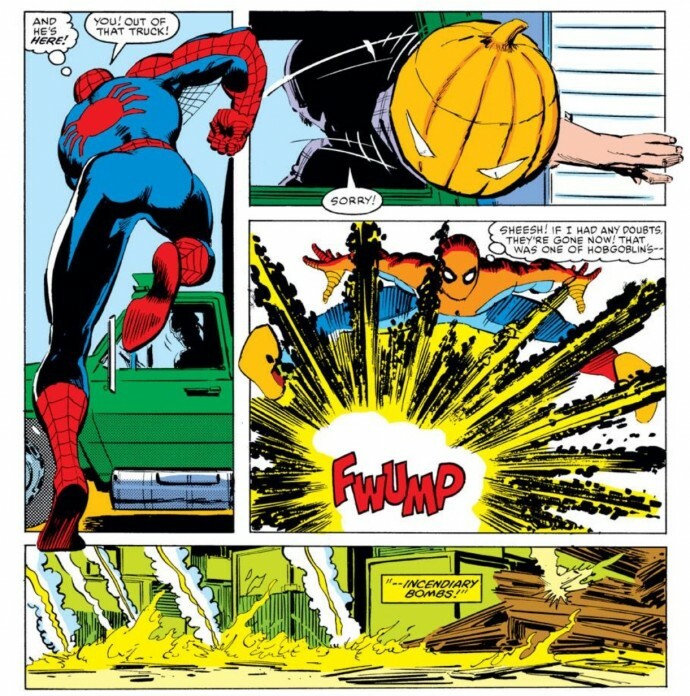 I have the power of hindsight here, but Stern seems so intentional and deliberate with how he’s weaving in details to these Hobgoblin story, I have to believe that there was at least a discussion around the bullpen of planting the seeds for a Peter/MJ reunion that would last for the long-term. In terms of the actual physical conflict of this issue, Stern works more misdirection and red herrings into this issue. 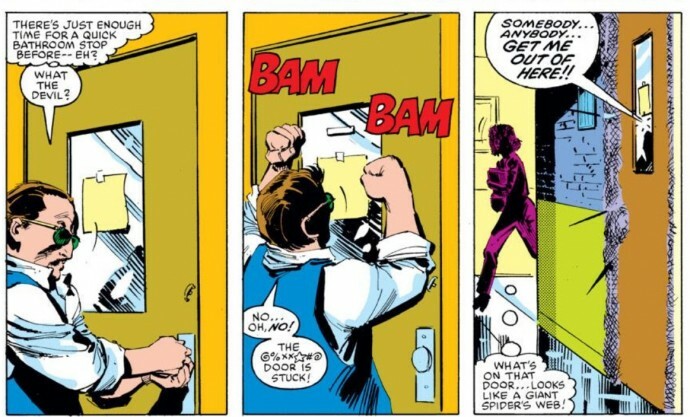 We have break-in’s at a Osborn chemical factory taking place in broad daylight as opposed to all of the Hobgoblin’s earlier heists that occurred in darkness and shadow. This plot development only further adds to the mystery of how is this new villain and if he’s using hired goons to take care of his business or if he’s doing it himself. A pumpkin bomb and some razor bats being throw out of a van by a shrouded-figured would indicate that the Goblin is physically at the scene of the crime. As the villain gets away, Spider-Man catches a name from the cops – Lefty Donovan – and he uses that as his lead. Of course, this would end up being another red herring. But even before his Lefty Donovan lead turns out to be bunk, Spider-Man is slowly coming to the realization that this new Hobgoblin is not another cheap knock-off of Norman Osborn’s Green Goblin a la Harry and his shrink, Bart Hamilton. Spidey talks about Hobgoblin’s methodical nature in contrast to Osborn’s manic insanity. This sequence is just another example of why Stern did such a phenomenal job building up his new creation. While it’s always nice to let the reader come to conclusions for themselves, having Spider-Man openly ponder the kind of threat he’s going up against elevates the tension. It lets the reader understand that up until this point, Spidey has approached this as if he was fighting one of his old villains. But if he’s ever going to get a leg up on the Hobgoblin, he was going to have to approach things differently. And the big reveal at the end of the comic confirms that straights have gotten direr for Spider-Man. We see Lefty, another potential Hobgoblin suspect, talking to the villain about his recent encounter with Spider-Man. That’s when the Hobgoblin reveals his grander plan is to combine his intellectual cunning with the actual physical power of the Green Goblin (through his serum) to become the superior threat to Spider-Man and the world at large. The only thing that’s still a mystery at this point is what exactly the Hobgoblin’s motives are. The scene with Donovan takes place at a large estate on Long Island, so that’s another clue that the Hobgoblin is someone of enormous wealth (and yet another strike against the initial Ned Leeds reveal after Stern left the title). Because Stern already has established the Hobgoblin as more cerebral, causing general havoc for Spider-Man doesn’t seem like reason enough for his existence. But obviously securing more physical power in the form of the Gobin’s serum, will enable him to defeat Spider-Man in route to his higher calling – something that we’ll eventually discover in the last act of this saga. This is part three of Chasing Amazing’s lookback at the Original Hobgoblin Saga. 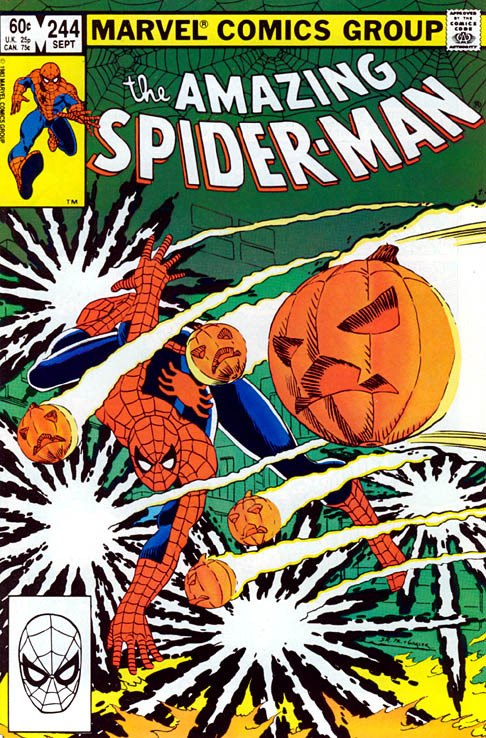 Next Thursday I’ll discuss Amazing Spider-Man #245.